We have lots to talk about this week. We’re going to start off with a discussion about a very controversial topic: The proliferation of what is being called fake service dogs. It’s becoming a national scandal and I’m sorry to say, a lot of RVers are involved, registering their dogs as service animals when, in fact, they have had no real service dog training and the registration is just a sham so they can take their pets with them wherever they want. We’ll also talk about a big RV trend… renting out your RV. There are now dozens of companies that are serving those who want to rent an RV for a vacation – just like out rent a vacation home. And the fleet of rental RVs come from RV owners who want to make some cash for their RVs when it would otherwise be just sitting in storage or their driveway. 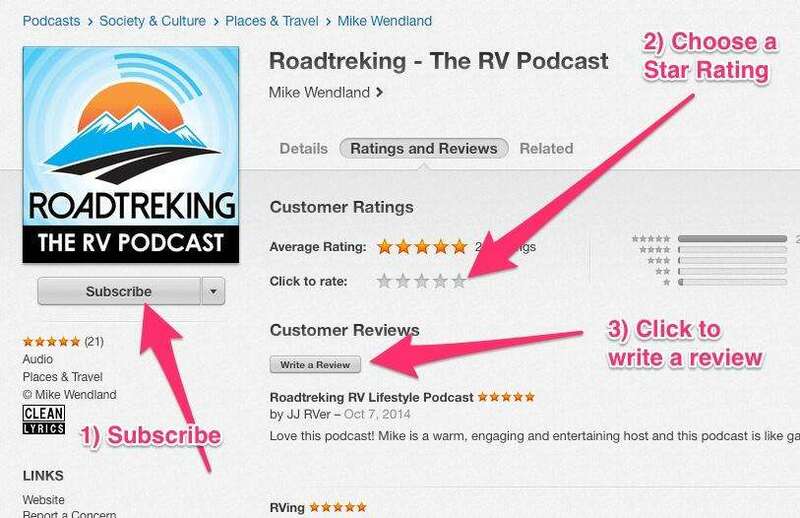 Plus your questions, comments and RV news, tips and suggested trips….all coming up in this week’s episode. It’s November. Snow is flying around the upper Midwest but we’re still in sunny and warm Florida. We'll start back to our home in Michigan, where we'll send the holidays, towards the weekend. This week, we want to talk about a growing national scandal involving service dogs. Today, any pet owner can go online and buy a vest for a dog to pass it off as a service animal to gain access to restaurants, hotels, parks, beaches and places of business. Most of the laws hit anyone misrepresenting their animal as a service animal with fines up to $500. There are an estimated 20,000 real, service dogs in the US; they are specifically trained to do tasks for a person with a disability and can help with disabilities ranging from vision impairments to seizures to autism and more. However, there are tens of thousands of other animals that have various pieces of service dog ID cards or vests that are available online by simply paying a fee. Just Google service dogs and you’ll see the ads. Passing off your dog as a service dog, when in fact it is not, is causing an uproar in the community for those who actually need one. An organization, Glad Wags Service Dogs, is making it known that “fake service” dogs are causing a huge problem, and it needs to stop, citing incidents in which non-service-animals have misbehaved in places they shouldn't have been allowed, casting real service animals in a bad light—or, in some cases, even injuring an actual service animal. Case in point: An incident in Sacramento just over a week ago, when a blind man’s working service dog was attacked by a pit bull whose owner falsely claimed the pet was a therapy dog. According to the Americans with Disabilities Act, it is illegal to ask about a person’s disability, require medical documentation, require special identification for a service animal or ask for the service animal to demonstrate the tasks it’s trained to do. And while the ADA was created to protect people with special needs from discrimination, sadly it does not thwart those who are able-bodied and seeking to take advantage of the service animal privilege. This week’s tip comes from a dental hygienist we met on a recent roadtrip. We were visiting around the campsite and she shared how important it is to keep our teeth cleaned while on the road. Thanks Joanne for a good reminder. So good, that I went out and bought a water pic myself that we now take with us on all our travels. What is the best way to remove snow from the solar panel on my Roadtrek? We are travelling with a truck and camper in Quebec, Ontario now then to Florida. Where can we find dumpsites and water fill ups off season. Thanks. We suggest using the RV Dumps app from All Stays. The peer-to-peer rental movement that is so popular with websites like Vacation Rental By Owner and Air bnb is sweeping the RV business like a wild storm. There are so many companies and dealers that now rent RVs that just keeping track of them can be quite a task. One of the newest is a firm called Campanda It started in Europe and has moved to the U.S. We recently talked to Nick Kubasek, the Chief Operating Officer of Campanda who shares with us how this movement is good for those interested in trying an RV out for short term rentals and for RV owners, who wan5t to make some extra cash by renting out their RVs when they would otherwise not be in use. Meanwhile, Campanda is far from alone. There are so many RV rental companies out there that we thought we’d share a list for you. By no means is this list comprehensive, nor do these firms necessarily have our endorsement, but here is a sampling of a few RV rental companies we found when we searched the web. With the advent of Google Home and Amazon’s Alexa, our homes have never been smarter. And now some new additions can help inexpensively expand those smarts to our RVs and beyond! Take the new Google Home Mini for instance. You get access to all of the Google Assistant in something the size of a doughnut! All it needs is a power outlet and wifi to work. That means you could easily put it in the bathroom, bedroom or RV and have access to the news, weather, your calendar and even your wifi lighting and Nest all via voice. And since Google Home Mini can recognize the difference in voices, when you ask Google what your day looks like it’ll know to read off your calendar rather than your child’s. Also, Google Home Mini is able to make phone calls and use your number so people know it’s you. And if music playing is really what you want out of your smart home, then you definitely should check out the Google Home Max. This smart speaker packs in the same features as the Google Home and Google Home Mini and with dual 4.5” woofers, it’s made for the ultimate in high fidelity sounds. In fact, Google Home Max is so smart, it adjusts the sound it’s pushing out to best match the acoustics of your room – so your music always sounds great. And if you want the same music playing on your chromecast in the living room as your Google Home mini or Max upstairs, just create a group in the Google Home app. Google Home Mini is available now at any Verizon store or at verizonwireless.com. Google Home Max will be available just in time for the holiday shopping season. When you’re heading south next time, especially if your path takes you close to the Great Smoky Mountains, carve out some time to drive the Forest Heritage National Byway in the Pisgah National Forest. More later on specific sights along the route, but first we’d like to share a taste of the fascinating story of this spectacular piece of the mountains. If you have any exposure at all to the history of our national parks, you’re probably familiar with the name of Gifford Pinchot, and if you boondock in the national forests, you owe him a debt of gratitude. Gifford’s father James made a fortune in lumber in the nineteenth century, but became increasingly distressed by the way forest management left the land barren and unproductive. He convinced his son to attend the National Forestry School in France. Upon his return, the two of them turned the family home, Gray Towers, into a forestry culture nursery and demonstration project. Meanwhile, Fredrick Law Olmsted was completing the design for the Biltmore Estate outside Asheville. Vanderbuilt had purchased thousands of acres of logged out grazing land adjoining the estate, and Olmsted was determined it should be returned to forest. He hired young Gifford Pinchot to oversee the work. The Biltmore Estate became home to the Biltmore Forest School and known as the “cradle of American Forestry” under Pinchot’s successor, Carl Schenk. Pinchot and his father went on to endow the Yale School of Forestry in 1900. Gifford Pinchot coined the term conservation ethic and, with the help of Teddy Roosevelt, established the value of publicly held forests as a resource for both commerce and recreation. He served in congress and twice as governor of Pennsylvania. So back to the Byway. Get on US 276 south off the Blue Ridge Parkway, and you’ll soon come to the Cradle of Forestry Center. Here you can dig a bit deeper into the history, and much more. Ride a helicopter simulator as it fights a forest fire. Look at the animals that live beneath the forest floor. See the cabin where forestry students lived in the early days of the Biltmore Forest School. This is the actual property Pinchot and Schenck restored. Head on down the byway and you’ll soon come to Sliding Rock. This is one of those places that might have disappeared in these liability conscious days, but not so. A shaded forest stream runs over a huge slab of rock as it passes down the hillside, and you can climb on out and ride it down. It’s fabulous fun, and holds a few surprises for first time visitors. There’s a bathhouse onsite for changing, and it costs a couple of dollars to park. Farther along the road is Looking Glass Falls, a spectacular cascade right beside the road. Trailheads lead into an area that is full of water features—streams and little rills, and wildflowers in season. Just before leaving the National Forest (formerly part of the Biltmore Estate), you’ll find the lovely Davidson River campground and a well-designed visitor center. Many of our national forests include scenic byways, and this one is especially rich in things to see and do. 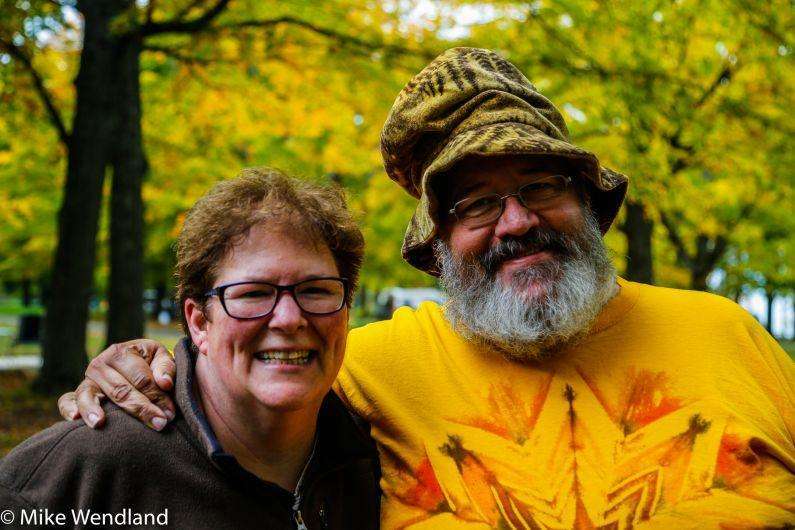 We’re Patti & Tom Burkett, and you may well find us here, off the beaten path. The choice of the light green/blue background with gold letters for the links has made it impossible for me to be able to see and read the links. I have 30% cataracts and guess that color combination doesn’t work well.